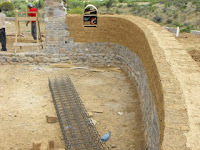 At last we can stop looking at our adobe piles and start using them to continue the walls! 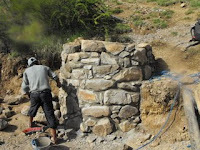 The dirt is sifted through wire mesh then mixed with straw and water to make the mortar that will anchor the adobes in place. 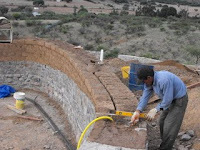 Our master craftsman Jeronimo ensures straight lines as he starts the process. 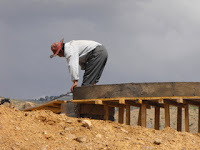 Ed makes the first of many plywood forms for a small window in the main bedroom to provide ventilation. 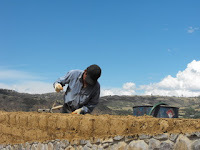 The 70 cm walls will keep the house warm in the winter evenings and cool in the summer. 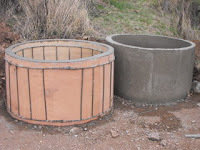 Additionally, they will need to be sturdy to support the flat concrete roof. Work is begun on the concrete lintels that will span the large glass doors and windows. 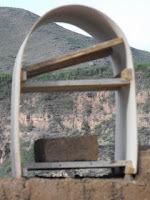 As in other Latin American countries, wooden posts are used for scaffolding instead of steel. 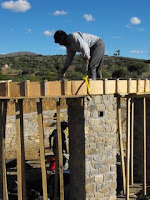 Thin plywood sheets are laid across the columns to form a base for the concrete lintels to be poured. 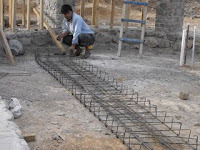 Reinforcing rods are bent into shape and hand-wired together to form 'cages' that will strengthen the concrete lintels. Because our walls are rounded, each cage has to be carefully manipulated into the required shape. 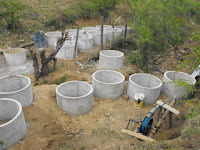 Forms are then built around the cages for the concrete to be poured inside. When the concrete is dry the forms are removed to reveal the lintel. 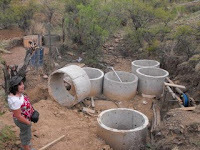 Having struck water, we then had to line the 11 metre dirt walls with concrete tubes. We made a form using thin plywood and reinforcing rods wired together. We made one tube every day, so it took a while to amass the sixteen tubes required. The tubes were lowered one by one using strong rope and even stronger men! Ed adds his weight to ensure their are no gaps between the tubes. 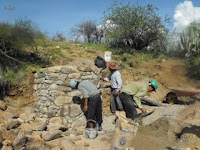 A wall of river stone is built to support the tubes above ground. And the finishing touches are applied. 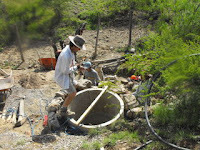 Later on we will build a small pump house to contain the well and keep the pump secure. 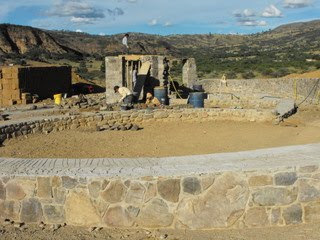 But there is the pressing need to get on with the house build as we are now in the rainy season. 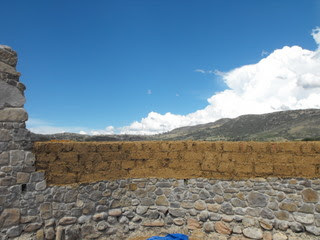 At the beginning of the rainy season (December to March) we started to get concerned about the huge spread of piles of adobe bricks, and the difficulty in keeping them covered against the rain. 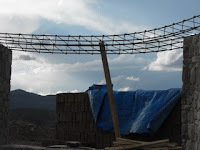 So we decided to move them into one huge mountain, and construct a roof made of poles and tarpaulin to keep the rain away. 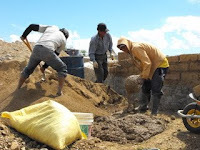 Even in the rainy season it only rains about once a week, but the force of the downpours could potentially turn our adobe bricks into piles of mud. Until we got the walls built and the roof on, we had to protect our precious oblongs of dirt. The moody skies were threatening!